This is a short tutorial on using Beans Binding in Metawidget. It should take around 10 minutes. I'd recommend you use your preferred Java development environment. If you use an Integrated Development Environment (IDE), you'll need to start a new Java project and add metawidget.jar to it. Otherwise, you just need to ensure metawidget.jar is on your classpath. 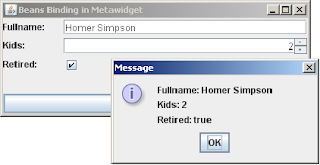 The SwingMetawidget has automatically populated itself with child components at runtime. 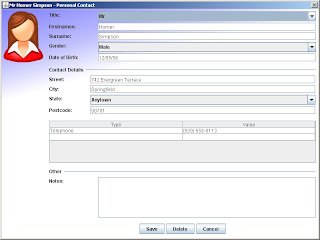 It has chosen JTextField, JSpinner, and JCheckBox components to suit the fields of the Person class. Metawidget is all about being native to the existing platform: it doesn't impose any additional dependencies on your code. By default, Swing doesn't provide an Object-to-JComponent mapping mechanism, so Metawidget doesn't either. 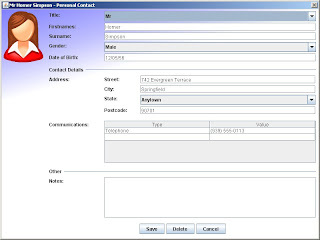 If you have Beans Binding available, however, Metawidget will use it. Metawidget supports several ways to control the components it creates. Here, we use the 'child components' approach: if you add a child JComponent with the same name as Metawidget would normally have given its automatically created component, Metawidget will use it in preference - but it will still apply Beans Binding for you. Run the code. The JComboBox will take the place of the JSpinner, but it will still be initialized by Beans Binding and data will still be saved back when clicking the Save button. That concludes our simple Beans Binding example. For a more 'real world' example (including using Beans Binding converters), please see the Address Book example in the Metawidget distribution. Many Metawidget layouts add a label beside each component, and it is sometimes handy to tweak this on a per-row basis. To hide the label without collapsing the left hand column, use a ResourceBundle to localize the label name to a blank space. Unfortunately, according to the DOM Element.getAttribute specification, it does not distinguish between 'an attribute having no value (eg. foo="")' and 'an attribute not existing'. In both cases getAttribute returns an empty String. ...which is a bit sucky I know. Update: After playing around with label="null" for a bit, I noticed DOM supplies an Element.hasAttribute method for this purpose, so you can differentiate after all. This is an important step in terms of having something to point people at to demonstrate my ideas, and to let them kick the tyres and provide feedback. I'm under no illusions: it's a very long road ahead. But hopefully now I can foster a handful of people and a bit of a community to help along the way.